In Lahaul-Spiti, over 90 per cent crops and trees were damaged in heavy snow on September 22-24. In the face of rising cases of freak weather events destroying crops, farmers have demanded extension of time period of the Weather-Based Crop Insurance Scheme (WBCIS) from July 31 till October 31 to cover apple crops and trees in August and September. In Lahaul-Spiti, over 90 per cent crops and trees were damaged in heavy snow on September 22-24, but the farmers got nothing in insurance, as the risk period had ended by July 31, the farmers said. Not only this, the farmers further demanded that the banks should be restrained from making any deduction from their bank accounts without their consent, whether they had taken crop loan or not. Besides, the farmers also opposed payment of extra premium for covering risk of hailstorms. The hailstones are a major threat to the apple industry and it should be brought under the WBCIS, the farmers demanded. According to the farmers, the crop insurance scheme is benefiting insurance companies more rather than the farmers, said Rakesh Singha, Theog legislator, and president of the HP Seb Utpadak Sangh. The crop insurance needs overhauling and should cover all risks throughout the year, he demanded. 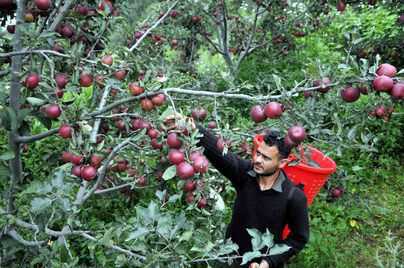 The apple season is harvested in September –October in Lahaul, whereas the WBCI Scheme ends its term on July 31 providing no “risk cover for the August-September period, admitted a horticulture official. The farmers in Shimla district said the government should integrate the WBCI Scheme. Dr ML Dhiman, Director, Horticulture, said, “The snowfall in September in Lahaul-Spiti could not be covered under the insurance, as the term expires in July and the government is considering the new problems arising from it in the scheme”, he added. As far as cases related to banks are concerned, Dr Dhiman said the Chief Minister during the state-level bankers committee meeting had directed the bankers to speed up loan cases of the farmers.